查特贝克的作曲包括 "Chetty's Lullaby", "Freeway", "Early Morning Mood", "Two a Day", "So Che Ti Perderò" ("I Know I Will Lose You"), "Il Mio Domani" ("My Tomorrow"), "Motivo Su Raggio Di Luna" ("Tune on a Moon Beam"), "The Route", "Skidadidlin'", "New Morning Blues", "Blue Gilles", "Dessert", 以及 "Anticipated Blues". ^ Chet Baker. Jazz Discography Project. [2013-12-18]. ^ 2.0 2.1 2.2 Ruhlmann, William. Chet Baker Biography. AllMusic. [2015-11-13]. ^ Gavin, James. Deep In A Dream: The Long Night Of Chet Baker. Chicago Review Press. 2011: 10. ISBN 9781569767573. ^ Gordon, Robert. Jazz West Coast : the Los Angeles jazz scene of the 1950s. Quartet Books. 1986: 72. ISBN 9780704326033. ^ Davis Inman. Chet Baker, 'My Funny Valentine'. American Songwriter. [2015-01-21]. ^ Review spotlight on... Jazz Albums. Billboard (Nielsen Business Media, Inc.). 1956-11-10: 86 [2015-11-13]. ISSN 0006-2510. ^ Ted Gioia. West Coast Jazz: Modern Jazz in California, 1945-1960. University of California Press. 1998: 191–. ISBN 978-0-520-21729-4. ^ Chet Baker interview about drug and jazz1980. YouTube. [2017-02-12] （意大利语）. ^ Pareles, Jon. 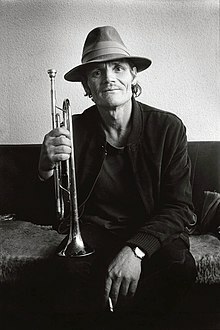 Chet Baker, Jazz Trumpeter, Dies at 59 in a Fall. NYTimes.com. 1988-05-14 [2016-03-25]. ^ Europa. O hotel em Amsterdã onde Chet Baker se hospedou. Janela ou Corredor?. 2014-03-21 [2015-03-10] （葡萄牙语）.